Nikita Bedrin wins a flag-to-flag prefinal in 60 Mini, while Bulansev and Giardelli fight for the win in OKJ, and the Lario Motorsport driver gets the better of his rival. Riccardo Longhi takes home win and fastest lap in KZ2. Nikita Bedrin is simply dominant also during the Prefinal: Russian driver leads the race from flag to flag and wins the race. Nobody is fast enough to catch the leader, but Brazilian Gabriel Bortoleto and Kirill Smal fight for the second position, while behind them Andrea Kimi Antonelli is drawing his masterpiece: the Antonelli Motorsport driver loses position after the green flag, but the Italian driver is able to earn positions lap after lap until the checquered flag, finishing second. In the final part of the race, the Brazilian Bortoleto overtakes Small, stepping on the lowest step of the podium. 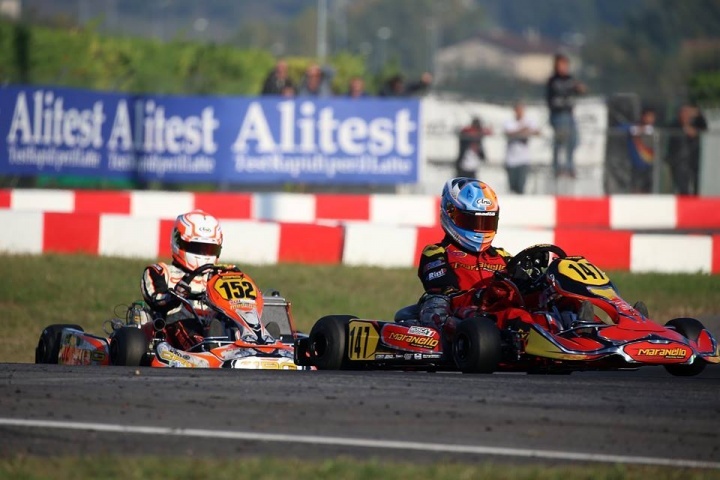 Spectacular prefinal for the OKJ class divided in two main battles: Pavel Bulansev and Alessandro Giardelli fight for the win, while behind their shoulders a group composed by six karts fight for the third place. The final of the race is just breathetaking: Alessandro Giardelli tails the Russian driver for all the race, and on final lap he overtakes the leader, but he brakes too hard before a turn, and after tha race he is called by the race direction. Third place winner is Civico Genis who recovers six positions and gets the better of Niklas Kruetten, Christian Cobellini, Ilya Morozov. Riccardo Longhi masters the prefinal race starting greatly from the second position after the green light, taking home the win and also marking the fastest lap. On the other hand the prefinal tastes bitter for Tommaso Mosca: passed by Mirko Torsellini and Andrea Dalè, the Maranello driver gets 10” penalty and a mechanical flag. Great race by 2016 European KZ2 champion Fabian Federer who recovers 13 positions, and finishes in seventh.